"When I wanted him to assist Jamaica, he was only interested in asking how Jamaica could assist the U.S. with its athletic program." - Jamaican prime minister Bruce Golding on meeting President Bush at the UN. 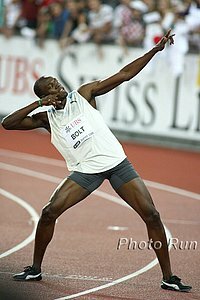 Usain Bolt Talks About Cricket, Doping, and the 400 He's got some good advice: "Success does not come overnight - you have to work hard to achieve your goals."